On 27th November 2017, the engagement of His Royal Highness Prince Henry of Wales and Ms. Meghan Markle was officially announced. On December 15th 2017 following a statement from Kensington Palace the official date for the wedding was set for May 19th 2018 and scheduled to be held at St George’s Chapel, Windsor Castle which is also where Harry was christened as a child. 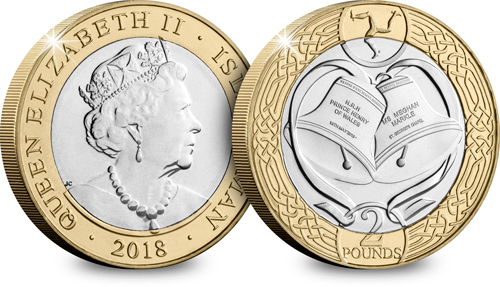 To mark this special event a unique circulating and commemorative coin has been issued by the Isle of Man Government and struck by Tower Mint. The design features two wedding bells created as renditions of the bells hanging in St. George’s Chapel Windsor Castle, where the wedding will be held. The prominent bell includes the inscription “H.R.H Prince Henry of Wales 19TH May 2018” while the other bell includes the inscription “Ms. Meghan Markle St. George’s Chapel”. Atop both bells includes a Latin inscription which reads ‘VENITE EXVLTEMVS DOMINO’ which translates as (O come, let us sing unto the Lord). Encircling the central motif is a ribbon formed in the shape of a love heart. The Isle of Man Government officially announced that they will be issuing a strict limitation of only 2750 Royal Wedding coins into circulation making this special issue a very limited offering. PreviousPrevious post:A Royal RequestNextNext post:Mike Hailwood remembered with a special £2 commemorative coin issue. We pride ourselves on sharing the stories of the world through our coins and medals. To start your project please contact us and one of our team will get back to you as soon as possible.